Yet another calendar year comes to an end, this one has been quite glorifying though. 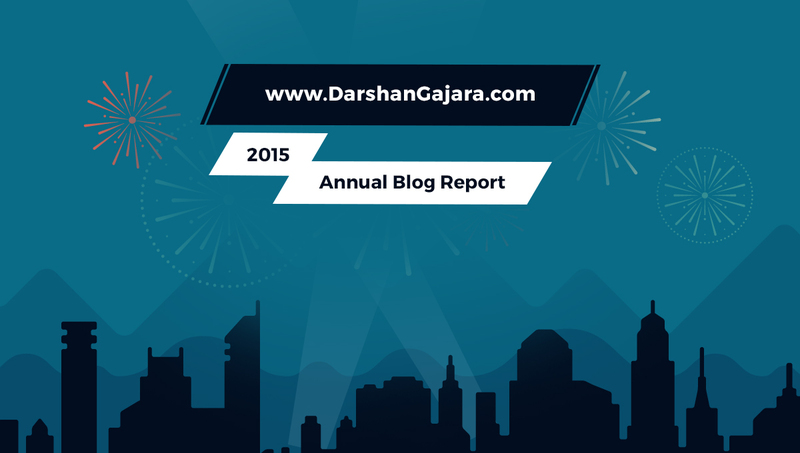 DarshanGajara.com has made remarkable progress in 2015. 47,000 views of 2014 grew to around 72,000 views. And yes, I can’t thank you enough for all the continued support & appreciation that kept me going. The Louvre Museum has 8.5 million visitors per year. This blog was viewed about 72,000 times in 2015. If it were an exhibit at the Louvre Museum, it would take about 3 days for that many people to see it. There were 280 pictures uploaded, taking up a total of 84 MB. That’s about 5 pictures per week. The most viewed post in a single day was Even Designers Have to Lie. In 2015, there were 45 new posts, growing the total archive of this blog to 162 posts. The top referring sites in 2015 were facebook.com, twitter.com & indiblogger.com. Visitors came from 160 countries. Most visitors came from India. The United States & Pakistan were not far behind. Engineers from M. Tech. colleges in Pune showed a lot of interest in the Programs section of the blog. Most commented on post in 2015 was Journey to 1,00,000+ Views. I’m totally amazed by these crunching numbers. 2015 has truly boasted the blog stats. I look forward to make it even more better with great response from you people (Visitors of this Blog). I also plan to write a dedicated article highlighting the best moments & achievements of 2015. Stay tuned for the same.